Remove dough from can; do not unroll. 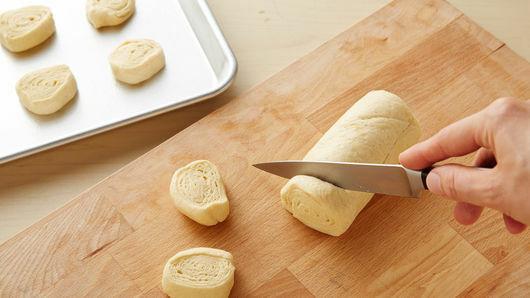 Cut roll of dough into 12 (1/2-inch) slices. Place 1 inch apart on cookie sheet. Bake 9 to 11 minutes or until just golden brown; turn over. Meanwhile, using 2 1/2-inch round cutter, cut 4 half circles from each slice of cheese for beards. Cut 1/4-inch strip from straight side of each half circle for bottoms of hats. 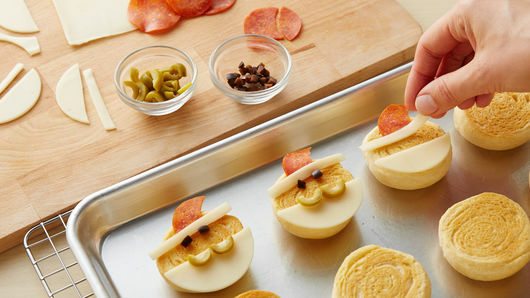 Using same cutter, make hats: Cut 1/2-inch football-shape piece away from right side of each slice of pepperoni. Using paring knife, cut 1/4 inch from bottom of each slice of pepperoni. Reserve remaining cheese and pepperoni for another use, or discard. Using photo as a guide, top with mozzarella and pepperoni. Decorate with olives. Bake 3 to 5 minutes longer or until crescents are golden brown and cheese is melted. Serve with warmed pizza sauce. 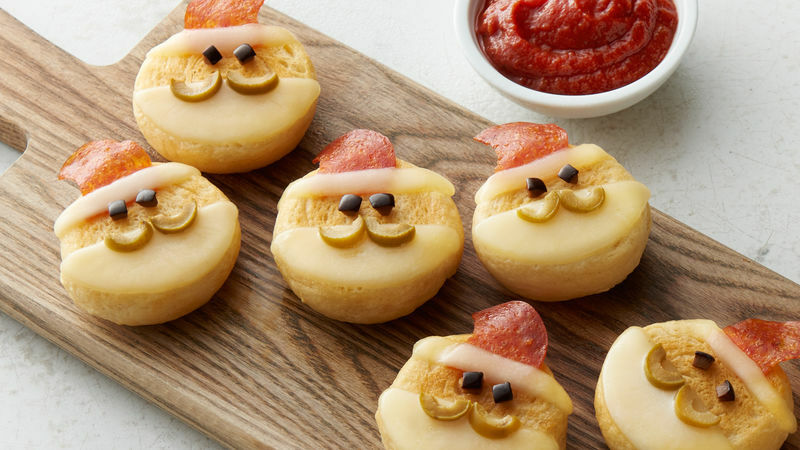 If cutting the pepperoni into a Santa hat shape seems too difficult, cut pepperoni into small triangles instead. A serrated knife is the best choice for cutting the raw dough, but a very sharp chef’s knife will also work.